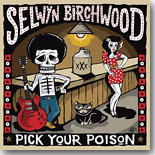 I didn't think I was going to like the new CD, Pick Your Poison (Alligator), from Selwyn Birchwood when it first showed up in my mailbox. I had heard a few random cuts from his previous album on the Sirius/XM blues channel, but nothing there grabbed me. It just goes to show that you shouldn't judge an artist just on a few quick listens, but instead dive into a full album and listen to it repeatedly. That's what I did with Pick Your Poison, and I'm already saving a slot for it on my annual Top Ten list. Birchwood sings with a signficant rasp in his voice, often a turn-off for me, but he packs so more energy and emotion to his vocals that it works. IN addition, he's also quite proficient on regular guitar and lap steel guitar. Backing Birchwood on Pick Your Poison is versatile horn player Regi Oliver, bassist Huff Wright, and drummer Courtney "Big Love" Girlie (great name!). The album kicks off with the primal blues song "Trial By Fire," given a real Hill Country vibe thanks to Oliver's flute accompaniment and a Sacred Steel gospel sound from Birchwood's driving slide work on the lap steel. Following is a raucous gospel-ish number "Even The Saved Need Saving," so very topical today with so much hypocrisy and hatred in the world. Birchwood sums it up with the recurring line " .... Ohhh, it's a hell of a world that we're livin' in, when the saved need saving .... " Right on, Selwyn. I was hooked by the time this number was over, clapping along and stomping my feet along with the rhythm. Birchwood plays a lot more energetic lap steel guitar, nicely framed by Oliver's horn solos. Birchwood shows off more of his creative songwriting (yep, he wrote all 13 songs here) on the country blues "Guilty Pleasures," on which he talks about how he doesn't like to gamble, drink whiskey, smoke reefer, romance the ladies and other vices, but that he still takes part in those guilty pleasures because, well, he just likes what he doesn't like. Get it? His guitar work is pulsating and driving, with plenty of heavy slide work. A similar theme is heard on the title cut, "Pick Your Poison," a funkier blues highlighted by Oliver's great baritone sax playing. One line sums up Birchwood's battle with this particular vice - " ... It's the enemy, but I miss it like a best friend ..." This dude sure has a way of making the best use of his agony. The guitar work stands out on the slow blues, "Heavy Heart," on which Birchwood tells his woman why this relationship needs to end. Continuing on his roadmap through pain and agony, "Haunted" has Birchwood picking up the tempo as he tells us what life is like now that the aforementioned relationship is over - " ...It's been four damn weeks since I had some sleep, this bed is too cold alone ... " and " ... Daymares during the daytime, nightmares come at night, my imagination gets the best of me, but my reality eats me alive ... " Some heavy stuff here. I'm now starting to figure out that the sequence of songs here may have been carefully chosen to take the listener on a trip through Birchwood's life. "Are You Ready?" has him talking about a movement taking place, turning of the page, a new sun on the rise, etc., etc. --- kind of a redemption sort of thing. Some strong guitar work here by Birchwood. But that positive feeling doesn't carry over to "Reaping Time," a very dark country blues where a man is going to make someone pay for taking his woman. And in the end, he sings " .... His victim lived just long enough to taste regret ... " Birchwood mixes in both slide guitar and lap steel for an effectively appropriate etheral sound. Birchwood returns with a funkier beat with Oliver's horn work punctuating his vocals on "R We Krazy?" He's so crazy after losing his woman that he started naming his guitars just so he'd have someone to talk to. Man, I really could hear Tom Waits doing this song --- I'd love to hear what he could do with it. Birchwood plays jazzier guitar riffs on this number while Oliver comes in with some soaring sax solos. "Police State" is another extremely topical song with Birchwood talking about police violence - " ... Sayin' you got the right to remain silent, seems they got the right, Lord, to remain violent, gotta shake these shackles before it's too late, or well be trapped in a police state... " The backwoods slide guitar work just accentuates the message here. Birchwood returns to ruminating about the woman no longer in his life with the mid-tempo "My Whiskey Loves My Ex" (I believe the title says it all about this number) and then on the slow, late night blues "Lost In You," featuring plenty of Oliver's subtle sax work while Birchwood sings about being the ghost of the man he used to be. I can really identify with the closing number, the funky "Corporate Drone," because like Birchwood sings on this tune I once gave up being a corporate drone and struck out on my own. " ... I used to work 60 hour weeks, so my boss could drive a Benz .. I won't buy into a world where cash is king ..." I know this is getting repetitive, but Oliver kicks in with some sterling sax work here. I like this CD more every time I listen to it. It's a slam dunk, no doubt Top Ten pick for me. Now I need to go back and take a listen to Birchwood's first Alligator CD (Don't Call No Ambulance) to hear what I've been missing. In the meantime, pick up your own copy of Pick Your Poison, and watch for Mr. Birchwood to visit your town.